The Oak Alley Plantation is located 70 miles or about 1 hour 10 min from the French Quarter. The pick-up begins at 8:15am. We use our sister company “Alert Transportation” for the ground transportation service. The driver goes hotel to hotel for the pick-up service. We ask that you allow us up to 30 minutes for the pick-up service. Pick up will be curbside of your hotel. You will spend approximately 2 hours at the plantation. The house tour will be about 35 minutes in length. The Oak Alley plantation house tour is provided by Plantation tour guides. The remainder of your time will be spent with self-exploration of the grounds. If you use your time wisely, you can grab a sandwich at the gift shop for lunch and still have time to walk the grounds. Our sister company “Alert Transportation” will then bring you to the swamp tour dock for your next adventure. On this tour, you will experience the best of both: an informative swamp tour and high speed thrill airboat ride. You will travel at high speeds in the airboat then slow down and stop for pictures. Your Captain will give you a tour of a life time explaining the culture, animals, and the swamps. You may even experience a close encounter with some of the local swamp life. You will return to you hotel around 5:00pm. 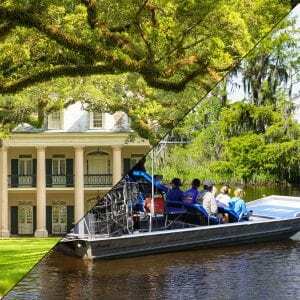 The Oak Alley plantation tour is one of the most magnificent plantation tours near New Orleans because of the 28 evenly spaced, huge Oak Trees that go from the river road to the Plantation House. It looks like the movie, “Gone with the Wind”. The Greek Revival home, dates back to 1837. Located on the grounds, is a restaurant, blacksmith shop, Souvenir Shop and antique farm equipment. It is a comprehensive plantation experience. The tour of the Oak Alley’s house is conducted by guides in authentic plantation style apparel. Walking is required for this tour. Plantation house to the restaurant and Souvenir Shop is about 1 block in distance. There are benches along the path, shaded by the Oaks. Over the years, many wonderful and fascinating individuals have had a hand in shaping a dream for Oak Alley … some tried and won, some tried and lost, others just tried and gave up. Still, they all had one thing in common … they CARED enough to try. Most of them are gone now, leaving only bits and pieces of the whole story … yellowed documents in parish archives, remembrances shared from generation to generation, a letter or two, a faded photograph yet, most important of all, Oak Alley herself. Oak Alley’s adaptive restoration in 1925 by her new owners, Mr. and Mrs. Andrew Stewart, was the first example of antebellum restoration along the River Road. Through the years, Oak Alley was the scene of many events affecting those who had given her a second chance at survival in the struggle against time and the elements. Josephine Stewart outlived her husband by 26 years and, shortly before her death on October 3, 1972, created a non-profit foundation, which would be known as the Oak Alley Foundation, in order that the home and 25 acres of grounds would remain open for all to share. We are only 35 minutes from New Orleans yet a world apart. Hold onto your hat! Our New Orleans Airboat Swamp Tour is a high speed adventure that is part tour and part ride. You will experience the best of both: a swamp tour and an airboat ride. You will travel at high speeds in the airboat then slow down and stop for pictures. Along the way, you will get a personal tour by your local Captain. Our airboats have stadium seating, so that the person in front of you does not obstruct your view. So, every airboat seat is great for experiencing the tour and viewing the wildlife. Yes, gators will get close, real close. So close that you will be able to look into those reptilian eyes.